Tag line: "The most shocking episode in the history of human survival"
On October 13, 1972, a small plane carrying 45 people, most of whom were members of the Old Christians Club Rugby team from Montevideo, Uruguay, crashed in the Andes Mountains. Due to the harsh wintery conditions, and because the plane had flown some 50 miles off-course, rescuers were unable to locate the crash site, and after 11 days abandoned the search, confident that everyone aboard had perished. What they didn’t know was that 27 people survived the crash, and were doing everything they could to stay alive in the below-freezing temperatures. After hearing on the radio that the search had been called off, and with their food sources exhausted, the living were forced to eat the bodies of the dead. Their ordeal lasted over two months, and by the time rescuers finally arrived on December 23rd, only 16 of the original 45 remained. Released less than 4 years later, director René Cardona’s Survive! is a detailed, often unflinching account of this disaster. Yet in spite of its close adherence to the facts, the movie falls short of the mark, and is only moderately successful in depicting the events of this horrible tragedy. Part of the problem was budgetary; the crash itself, despite the obvious use of models and miniatures, is certainly tense, but the snow never once looks real (it has the consistency of Styrofoam ground up into small flakes), and as a result, we’re never convinced anyone is truly freezing (the actors themselves don’t help matters: at one point, a survivor is walking around outside the plane with his shirt off!). The search and rescue effort, which takes up a good portion of the first half of the movie, is also an issue. Featuring a handful of poor performances, these scenes carry no dramatic punch whatsoever, and weigh the entire production down. Then, at around the halfway point, Survive! turns a corner, transforming itself into the tense motion picture we were expecting from the get-go. Realizing they weren’t going to make it without food, the remaining few decide to eat their deceased friends and colleagues. In a very graphic scene, one of the bodies lying in the snow is carved up, cut into small strips of meat that are then carried back to the plane. 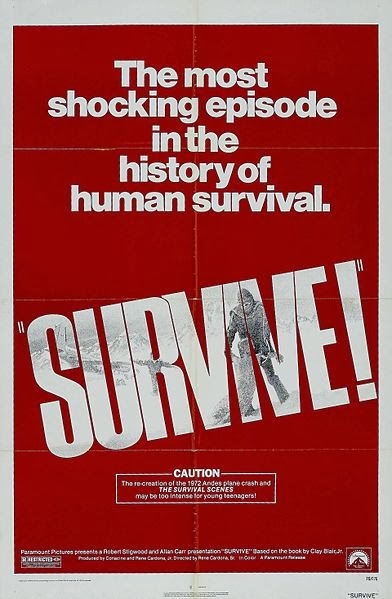 One by one, the survivors leave the plane to eat the raw flesh, which had been left outside to dry, a sequence that is easily the film’s most poignant. From this point on, Survive! is an edgy, occasionally frightening motion picture, and the raw power of its second half more than making up for its early weaknesses.